The ZyXEL GS1920-48HP 48-Port Smart Managed Gigabit PoE+ Switch offers network protection features and comprehensive access management functions to establish a reliable and secure network environment. With easy deployment, smart management and solid security, this ZyXEL GS1920-48HP Gigabit switch is the best solution for SMB networks. Forty-four (44) Gigabit PoE RJ-45 ports and two (2) Gigabit SFP ports. Four (4) Gigabit combo (RJ-45/SFP) ports. 802.3at Power over Ethernet (PoE+) up to 30W per port, total 375W budget. Supports ZON Utility, ZON inter-device features and iStacking facilitates easy network initialisation and management. Reliable network availability with Loop Guard, IPSG and CPU protection. Intrusion lock, RADIUS, static MAC forwarding and 802.1X authentication-enhance network security. Would you like access to L2 features such as LACP, advanced QoS, VLAN, ACL and multicast IGMP snooping, without learning complex command-line interface(CLI)? You can with the intuitive web-based interface. This ZyXEL GS1920-48HP PoE+ switch supports 802.3at PoE Plus standards, with a 375-watt high-power budget to meet the connectivity needs of additional powered devices like 802.11ac WLAN access points, VoIP phones and IP cameras. Not only does this ZyXEL GS1920-48HP PoE+ switch feature full PoE ports, it also employs intelligent technology. While set to Consumption Mode, switches can automatically detect the power consumption status of each powered device and supply only the amount of power required. This intelligent power allocation function minimises wasteful overpowering of devices, thereby helping businesses save money, while enabling the PoE switch to power more devices. Network disruptions are a frequent source of headaches for small to medium-sized businesses. Whether outages are caused by internal errors or outside attack, this ZyXEL GS1920-48HP switch protects users from network disruptions and ensures uninterrupted connectivity through several key features. Loop Guard helps networks avoid service disruptions caused by switching loops, and IP Source Guard (IPSG) shields your network from MAC spoof and ARP spoof attacks. Additionally, attacks such as BPDU, ARP and IGMP can target network facilities. However, CPU protection guarantees that a network continues to operate, even while under attack. 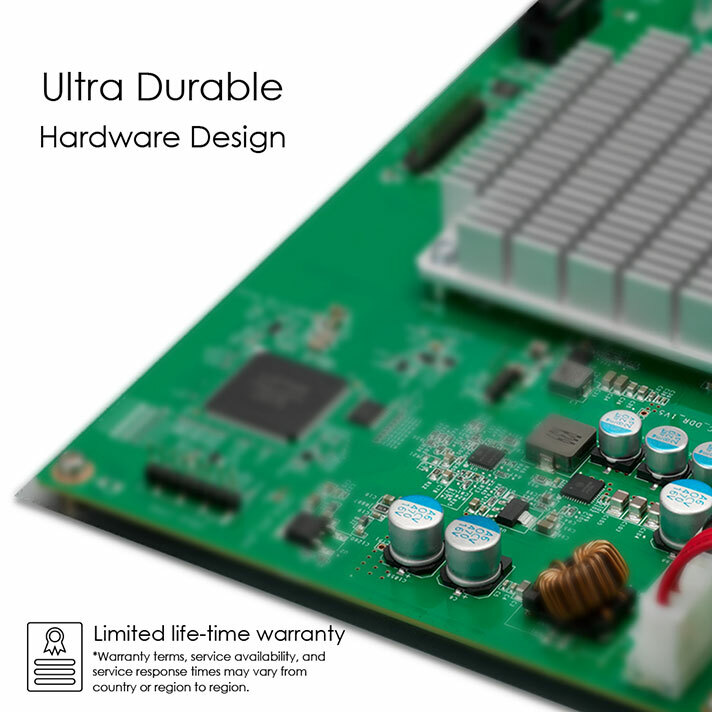 Furthermore, dual firmware image and configuration features improve network reliability and availability. 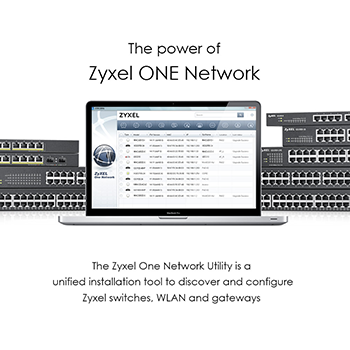 These are just some of the ways this ZyXEL GS1920-48HP switch guarantees headache-free network connectivity for SMBs. This ZyXEL GS1920-48HP switch provides efficient allocation of network resources while ensuring comprehensive access protection, along with simple and secure network control. Intrusion Lock detects connection status and ensures port security. Not only does this ZyXEL GS1920-48HP switch support 802.1X authentication with RADIUS, but it can monitor, filter and police all traffic between clients within the same subnet, creating an even higher degree of security. There’s no need to learn a new command line interface. 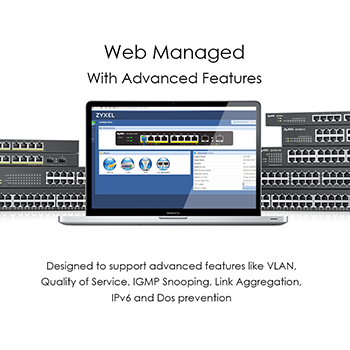 This ZyXEL GS1920-48HP switch simplifies network management with a user-friendly web management interface. Additionally, full IPv6 support with features including auto configuration, duplicate address prevention, dual-stack and neighbour discovery, this ZyXEL GS1920-48HP switch can easily migrate to the next-generation Internet Protocol in the future to ensure your investment is protected. Futureproof your network for growth with the The GS1920 series. Ideal for SMB deployments in multiple scenarios, the GS1920 series provides up to 28 Gigabit copper ports for 24port models, and up to 6 Gigabit fiber ports for 4 port models.